why did Jones take such a large professional risk by asking other scientists to destroy documents? A correlative question for the other scientists (Briffa, Mann, Wahl, Ammann) is why they agreed to co-operate with Jones in this bizarre enterprise. These questions are not just Holland’s. They are important questions that deserve an answer. But despite multiple so-called “inquiries”, Holland’s questions about Jones’ email deletion “enterprise” remain unanswered. Indeed, it would be more accurate to say that, as far as the inquiries are concerned, they remained unasked. Instead of unravelling the conduct of Jones and his Team, the “inquiries” have been wilfully obtuse, both refusing to ask the salient questions and determining the matter on empirical findings that were either blatantly untrue or unsupported by the evidence that they collected. In the UK, Muir Russell was commissioned by the University of East Anglia to inquire about the emails, but didn’t even ask Jones whether he deleted the emails. Muir Russell “explained” to the Parliamentary Committee that, if he had done so, he would have been asking Jones to admit misconduct. That a panel commissioned to inquire about misconduct should refuse to grasp the nettle of actually inquiring about misconduct is unfortunately all too typical of these sorry events. Muir Russell’s subsequent report then contained findings on email deletion that were blatantly untrue and known to be untrue to hundreds, if not thousands, of readers who’ve followed these events. In particular, even though Jones’ email initiating the deletion enterprise was marked re “FOIA” and was a direct response to Holland’s FOIA request, Muir Russell obtusely reported that there was no pending FOI request at the time of Jones’ deletion email. This sort of wilful obtuseness and/or incompetence was one of a number of factors that resulted in the Muir Russell “inquiry” exacerbating, rather than diminishing, the polarized attitudes in this field. In today’s post, I’ll review the recent NSF Office of the Inspector General report as it pertains to Jones’ document destruction enterprise, together with the Penn State Inquiry Committee that it reviews. Like Muir Russell, both the Penn State Inquiry Committee and the NSF OIG neglected to consider obvious and fundamental questions about Mann’s participation in Jones’ document destruction enterprise and arrived at empirical conclusions that were unsupported by the inadequate record that they had collected. Although the defects in the Penn State Inquiry Committee’s handling of Mann’s participation in Jones’ email destruction enterprise are or should be obvious to any Inspector General (and had been pointed out long ago at Climate Audit), the recent report of the Inspector General condoned Penn State’s mishandling of these matters, as I’ll discuss in today’s post. Far too much attention in this controversy has been focused on Mann and not enough on the enablers. I once again re-iterate this observation and request and ask people to focus more on the conduct of the inquiries and institutions than of the scientists and grant recipients. For the record, I was one of the people interviewed by the NSF Office of the Inspector General (OIG), though I see no evidence of my input in the report. I’ll discuss this in a follow-up post. Jones’ email asking other scientists to destroy documents pertaining to the IPCC Fourth Assessment Report is probably the second-most notorious Climategate email (after the trick email). Can you delete any emails you may have had with Keith [Briffa] re AR4? Keith will do likewise… Can you also email Gene [Wahl] and get him to do the same? I don’t have his new email address. We will be getting Caspar [Ammann] to do likewise. That Mann lived up to his promise to Jones to contact Wahl about deleting the emails seems certain. In early 2011, from the report of the NOAA OIG, we learned that Wahl (by this time, a NOAA employee), told the NOAA IG that “he believes that he deleted the referenced emails at the time”. To date, Mann’s email to Wahl (forwarding Jones’ request) has not been documented, nor has Wahl’s reply, if any, acknowledging Mann’s request. As a result, we do not know what commentary, if any, was added by Mann when he forwarded Jones’ request. Did he add any endorsement or caveat? If so, what? Did Wahl acknowledge Mann’s email? If so, what did he say in his acknowledgement? Nor, for that matter, do we know whether any of the inquiries sought out such information, as they are all silent on this aspect of the investigation. As to the documents that underlay Jones’ deletion enterprise, they were not “ordinary” academic correspondence about prospective journal articles, but correspondence to Briffa in his capacity as an IPCC Lead Author. In particular, the correspondence addressed one of the then most controversial IPCC issues, their assessment of the Hockey Stick controversy. While Jones’ email destruction enterprise cast a broader net, Jones was most concerned about destroying the emails in summer 2006 between Briffa and Eugene Wahl, who, with Caspar Ammann, had been a co-author of the Team response to the McIntyre and McKitrick criticisms of the Hockey Stick. This correspondence had been carried out surreptiously, a word that I use because Wahl and Briffa’s own words characterized their correspondence this way (using terms like “for your eyes only” and “confidential”). Nor was the correspondence copied to their usual cc partners. It appears certain that Wahl (who was not registered as either an IPCC Contributing Author or even as a reviewer) altered the IPCC assessment of the Stick controversy from the assessment that had been sent out to external reviewers to an assessment that favored his own interpretation of the Hockey Stick, trivializing our criticisms and supporting Mann’s position. (The University of East Anglia refused my 2011 FOI request for the critical attachments to this correspondence, a refusal presently under appeal at the UK ICO.) Wahl’s assessment was then relied on by government agencies e.g. in Julia Slingo’s evidence to the UK SciTech Committee in March 2010. Academic misconduct investigations are supposed to have two stages: an “inquiry” committee, which is sort of equivalent to a grand jury stage, designed only to see whether there are grounds for an “investigation”; and an “investigation” committee, which is charged to investigate counts arising from the inquiry committee and weigh the defence. See a prior CA discussion here. Commencing on or about Nov 22, 2009, Penn State received “numerous communications (emails, phone calls and letters)” from “University alumni, federal and state politicians, and others, many of whom had had no relationship with Penn State” making a variety of accusations against Mann, including accusations of “destroying records”. (See the report of the Inquiry Committee here, which is the source of most of the chronology in this section.) On November 24, 2009, Eva Pell, then Senior Vice President for Research and Dean of the Graduate School, “decided that the matter should be examined by the process articulated in RA-10” [the Penn State research misconduct policy] and met with the relevant Penn State officials. As the NSF OIG put in their recent report, the public emails “reasonably caused individuals, not party to the communications, to suspect some impropriety on the part of the authors”. The purpose of an Inquiry Committee is to determine whether “there is sufficient evidence to warrant an investigation”. The Office of Research Integrity has observed that, from time to time, inquiry committees go beyond their mandate and, despite their restrict ed time and resources, purport to carry out the investigation that should have been handed off to a properly constituted investigation committee. The U.S. Office of Research Integrity discourages this practice, as discussed in a prior CA post here [elisions in the following pertain to an inapplicable situation]. On occasion, ORI receives an inquiry report in which either the committee has conducted the equivalent of an investigation and made specific findings… These reports may violate the PHS regulation and cause substantial difficulties for ORI’s oversight. Findings made at the inquiry stage are all too frequently incomplete because the record has not been fully developed… Both instances may deprive ORI of the facts necessary to determine whether there has been an adverse effect on the PHS sponsored research, and the institution may be required to reopen its case and initiate an investigation. Other references and discussion are in the CA post here. The Inquiry Committee obviously believed that there was “sufficient evidence to warrant an investigation” of Allegation #2, as it proceeded to carry out its own investigation of the allegation (rather than allowing a properly constituted investigation committee to do so.) Unfortunately, the caveats of the Office of research Integrity about the problems of an Inquiry Committee usurping the role of an investigation committee were realized, as we shall see below. Finding 2. After careful consideration of all the evidence and relevant materials, the inquiry committee finding is that there exists no credible evidence that Dr. Mann had ever engaged in, or participated in, directly or indirectly, any actions with intent to delete, conceal or otherwise destroy emails, information and/or data related to AR4, as suggested by Dr. Phil Jones. Dr. Mann has stated that he did not delete emails in response to Dr. Jones’ request. Further, Dr. Mann produced upon request a full archive of his emails in and around the time of the preparation of AR4. The archive contained e-mails related to AR4. Regardless of whether Mann’s participation in Jones’ deletion enterprise constituted research misconduct or not, this particular finding of the Inquiry Committee clearly does not follow from the information that they presented in their record. That Mann was able to produce a zipfile containing his own emails related to AR4 in January 2010 is neither here nor there in respect to his participation in Wahl’s admitted deletion of his emails, conduct which would clearly fall within the terms of Allegation #2. Not only does the conclusion not follow, but, as the Office of Research Integrity had warned against, the Inquiry Committee completely neglected its obligation to create a proper investigative record on Mann’s participation, if any, in this aspect of Jones’ document deletion enterprise. Did they examine Mann’s email to Wahl, forwarding Jones’ deletion request? Did Mann add any endorsement or caveat? If so, what? Did Wahl acknowledge Mann’s email? If so, what did he say in his acknowledgement? Even the most elementary investigation ought to have obtained this material and reported on it. However, the Inquiry Committee did not report that they did so, and one can only assume that they were negligent in this aspect of their duties. Nor did Mann’s production of a zipfile on January 18, 2010 fully answer the Inquiry Committee’s question in respect of his own emails. The language in Allegation #2 is framed to also include actions with the intent to “conceal” emails. It is easy to imagine circumstances in which Mann removed the emails in question from his work computer (potentially subject to FOI or other investigation), while keeping an archive on a thumbdrive at home. Such conduct would arguably be an action “with intent to … conceal” emails. In a proper investigation, a report from the IT department on the provenance of the zipfile would have been commissioned: was the archive at all times on Mann’s work computer or had the zipfile been moved off premises. (At CRU, Briffa admitted moving emails off premises for “safekeeping”, though the admission was never pursued by the Muir Russell inquiry or University of East Anglia administration.) Similar actions by Mann cannot be precluded. These defects in the Penn State process were evident at the time – and were reported at Climate Audit. They should have been even more evident to specialists from the National Science Foundation, to which report I now turn. NSF’s re-framing diverted attention away from Mann’s participation in Wahl’s document destruction, an issue that falls squarely within the terms of Penn State allegation #2, but perhaps not the re-framed terms of reference. We next considered the University’s second Allegation, related to the emails. We reviewed the emails and concluded that nothing contained in them evidenced research misconduct within the definition in the NSF Research Misconduct Regulation. The University had been provided an extensive volume of emails from the Subject and determined that emails had not been deleted. We found no basis to conclude that the emails were evidence of research misconduct or that they pointed to such evidence. We concluded that the University adequately addressed its second Allegation. We wrote to the University, requesting an extensive amount of documentation related to its investigation, including copies of all documentation the committees used in their assessments, copies of all interview transcripts, and specific transcripts or memorandums about certain conversations to which the report referred. The University had been provided an extensive volume of emails from the Subject and determined that emails had not been deleted. We found no basis to conclude that the emails were evidence of research misconduct or that they pointed to such evidence. I acknowledge that reasonable people can disagree on whether the “emails” referred to in this sentence were the Climategate emails or the zipfile emails. Obviously the “emails” should have been defined in the OIG report. If the NSF limited their review to the emails on the Mann zipfile provided to the Inquiry Committee, this is hardly determinative of whether misconduct was evidenced in the Climategate dossier. There are many other issues and defects with the NSF OIG report. It is an Oxburghesque 5 pages. It is undated and unsigned (it is on the letterhead of the Office of Investigations). It states that it interviewed various parties, but, unlike a similar report from the NOAA OIG, does not give any information on those interviews. I was one of the people interviewed by the NSF Inspector General. However, I might as well not have been interviewed as the report makes no mention of the issues that we discussed at our meeting. More on this another post. During the time that I’ve been involved in climate, the U.S. NSF has had a pernicious role in enabling and endorsing Climategate conduct. This is not a new theme. Prior to Climategate, from time to time, I drew attention to the responsibility of enablers and (I think) that I was, if anything, more critical of the bureaucrats for not ensuring compliance than of the grant recipients who abused their compliance responsibilities (for example, see here , here.) I will try to review their conduct in a future post as well, as some of NSF’s most questionable conduct occurred in 2003 and 2004 prior to Climate Audit. This entry was written by Stephen McIntyre, posted on Sep 2, 2011 at 2:02 PM, filed under Uncategorized and tagged email-deletion, inspector-general, nsf, oig, penn state. Bookmark the permalink. Follow any comments here with the RSS feed for this post. Both comments and trackbacks are currently closed. The question to M Mann was phrased in such a way as to allow him to deny that he deleted any E-Mails, without addressing the matter of passing on P Jones request that ask others to delete E-Mails. Thi was a symbiotic enquiry. Muir Russell “explained” to the Parliamentary Committee that, if he had done so, he would have been asking Jones to admit misconduct. Whereas in addiction recovery admitting the fault, owning it, speaking it out as plainly as possible, publicly, is the only way back to health. Perhaps it’s more like the US 5th amendment, attempting to get someone to incriminate themselves. You must be right. Russell was pleading the 5th. Couple of details a bit strange about that – person doing it, jurisdiction – but at a PR level would be thought to chime well in the US market. Team players, every one. In the US, investigators commonly ask suspects if they committed the crime. I cannot imagine it is different in the UK. Of course, suspects have the right to an attorney and they have the right to refuse to answer the question, but it is highly unusual for an “investigation” not to ask the question. The difference is law enforcement vs a scientific inquiry. Steve – you have not phrased this correctly at all here. Universities have codes of conducts; societies have laws. An action can be misconduct without being a crime. The difference is between enforcement of laws and enforcement of codes of conduct. What I meant was that law enforcement can ask a suspect if they’ve committed a crime. Perhaps the inquiry, not being law enforcement, isn’t able to. I don’t know if that’s the case. The question of deleting FOI-able documents is possibly a criminally punishable offense, so maybe that’s why they couldn’t ask. Of course they can ask. It happens all the time. All it means is that if the person denies this kind of wrongdoing you take into account that they wouldn’t wish to be convicted of a legal offence. It’s an additional motive for them to be economical with the truth, in other words. But you’re allowed to ask and you’re certainly allowed to pass on any information you discover to the police. I’m only unsure when that becomes a legal obligation. Given that reviews allowed CRU and Mann to control the evidenced process and that they could not even see what evidenced there was, when the evidenced when it was standing in front of hem shouting ‘ I am the evidenced’ in their ear, while wearing a huge T-shirt with the words ‘THE EVIDENCED’ written on it , is their failure to ask meaningful questions beyond ‘did you do it ‘ any real surprise. The allegory of the three wise monkeys, how see nothing, hear nothing and say nothing , could only wrongly be applied in this case becasue of the word ‘wise ‘ in the description. Umm, it’s “evidence” not “evidenced”. How do you prove an e-mail has been deleted other than to compare e-mail records from an individual computer to a corresponding backup server? An email has a sender and a receiver. If you find the message in the receiver’s archive, and do not in the senders, then you can conclude the sender deleted it. To say you can conclude the email was not deleted, and know of its existence in the receivers archive, you have to find it in the senders archive. This pertains especially to Mann’s reply to Jones on contacting Wahl to delete emails. Steve I know you are not a fan of getting courts involved in matters of science but it appears that this may be the only way of getting at the truth. Certainly in NZ this was the only way of enforcing FOIA type requests and progress has been made. Similarly, U of V gradually peeling away the layers. Unfortunately, more such actions seem to be required. What I really don’t understand is why they they put their future integrity on the line by sticking fingers in their ears after poking out their eyes and continually ignore the evidence that some of their advisers have been economical with the truth. Dr. Mann has stated that he did not delete emails in response to Dr. Jones’ request. Further, Dr. Mann produced upon request a full archive of his emails in and around the time of the preparation of AR4. The archive contained e-mails related to AR4. Penn State said they got the zip folder from Mann on January 18 2010 and interviewed him 4 days later, on January 22. There is no mention in the Penn State report that during those 4 days they contacted the university’s IT department. I would like to know on what basis the IG concluded that the university determined that emails were not deleted. It appears that they based their determination on Mann’s own assurances, which is hardly adequate. The fact that there were some AR4-related emails in the folder doesn’t settle whether a specific email from Mann to Wahl passing on Jones’ request to delete AR4-related correspondence had once been in there but had later been deleted. Facts is because Wahl let it out of the bag , Mann did pass on this e-mail and Wahl did attempt to meet this request . Manns’ story changed to he ‘only’ passed it on and added nothing to it , the line he sold Penn State was BS. Perhaps stating the obvious, but if Mann did ask Wahl and if Wahl did comply then one might expect that Mann and Wahl would then immediately delete any record both of the request and any response and any action taken. And they’ve had plenty of time to have compliant IT people in their respective institutions to sanitise back up servers as well. The UK Commons Select Committee which investigated “The disclosure of climate data from the Climatic Research Unit at the University of East Anglia” is to start a new inquiry which includes Climate Science. It might be time to renew the old open threads. Sea ice was always fun. There is a ton of stuff going on and the Roy Spencer editorial resignation deserves some attention at this point. IMHO this is wrong. You focus too much on the people who are prepared to whitewash the offense, rather than those who might have committed it. I use *might* because it is still not clear that any offense was actually committed other than Jones’ request to delete emails which is subject to statue of limitations. It is pretty certain that Mann passed on the request (he said so – under English law that would be an offense) but it is not clear that he or anybody else acted upon it. Your focus is – why didn’t the reviews ask? (In the Penn State inquiry they did ask and Mann gave a carefully worded response that they believed without further investigation), but you insinuate things beyond the available evidence. It is almost certainly morally wrong (rather than legally) that they failed due diligence, but for me the original offense(s) is/are more important. That’s not to say that the reviews are not subject to criticism. IMHO Steve is right. Wrath towards Mann – or Jones – isn’t the answer. This is the flip side of ‘Poor Phil’. Both men were playing the system but the system was not created by them. In fact we know the message in ,what ever form, was acted on and we know Mann passed it on, Wahl has let that cat out of the bag. The argument now is over if Mann added anything to it or what he knew about it. His old argument or rather doge he not passed it on has gone . It is a fact in evidence that Mann sent an email where he agreed to “contact” Wahl ASAP (about Jones request to delete emails on AR4). So clearly they found this email in the zip files. So NFS does not think Mann’s agreement to contact Wahl about deleting emails is research misconduct. Otherwise we have another case of utter buffoonery where-in a review of the Penn States inquiry did not actually occur in substance, or NFS engaged in a deliberate effort to white-wash the matter. I don’t see any other possibilities. If none emerge, then anyway you want to have it, NFS discredits itself on the matter. Please read the post to see why this alternative is not adopted by either Penn State or NSF. I observed in my post that Penn State took the position that allegation #2, if substantiated, would be misconduct. NSF endorsed Penn State’s analysis. Nor do we know that NSF engaged in a “deliberate attempt” to whitewash the matter. It is possible that they were incompetent, though I agree that the accumulation of incompetence in the various inquiries is somewhat suspicious. I agree that the accumulation of incompetence in the various inquiries is somewhat suspicious. Even if it was a coincidence it would embolden anyone who knew they had done wrong – or anyone who saw that wrongdoing had occurred but that there was no penalty. My hunch is that Jones no longer takes the initiative, for example, in getting Journal editors who transgress Team standards removed. Others have taken over the role but, again, the system is the same. And those within it emboldened. Still, Willis says the most important thing, which is thank you. What got my attention is your statement pertaining to the lack of follow up on the implications of Mann’s agreement to further Jones request by contacting Wahl. Lets recall Penn State inquiry said; “After careful consideration of all the evidence and relevant materials,”. Foley directly referenced the substance of Jones emails, and Mann’s reply. They are stating they pondered the implications there-in – to my mind. Keep in mind we have well educated individuals charged with an inquiry of misconduct. So what is a reasonable conclusion? It is true that concluding it was a “deliberate white-wash” is not supported by a smoking gun. But, I don’t think negligence as in it simply didn’t occur to them to pursue the matter, but should have – is what “one can only assume”. You’re mixing up Jones’ email to Mann and Mann’s acknowledgment with Mann’s email to Wahl and Wahl’s acknowledgement. Yes, they referred to the former, but they did not state that they examined the latter and it is reasonable to assume that they neglected to do so. Examination of Mann’s correspondence with Wahl was relevant to allegation #2 and their failure to address this was, in my opinion, negligent. Whether this occurred because it “didn’t occur” to them or for some other reason is irrelevant to this point. And yes, they may be “well educated” but they are obviously inexperienced in conducting inquiries or else they wouldn’t have botched their procedures quite so thoroughly. One aspect I am trying to get at is that there may well be no email between Wahl and Mann on the matter. Mann said he would “contact” him. He could have just called him on the phone. If he called him, then looking for emails would turn up nothing. I haven’t seen evidence of email, just that some communication apparently occurred with Wahl’s admission. They may have looked and found nothing, and thus let it go. Regardless, that Mann in his reply back to Jones agreed to contact Wahl should have set off alarm bells and spurred investigation, beyond just looking for emails about it. Point being they didn’t confront Mann on his agreement with Jones to contact Wahl when questioning him. They had proof of his agreement. I now realize Wahl has confirmed he was informed by Mann via email on the deletion request. I tried to turn up the heat under the NSF with my open letter to Dr. Suresh, the new incoming head. It’s depressing to re-read the ludicrous attempts to show that the un-indicted co-conspirators have souls as whitewashed as snow. Thank you for your tenacious persistence in all of these matters. Willis, grammar check time. Please stop contributing to the misuse of “co-conspirators”. A “conspirator” is, by definition, to secretly plan and act with others. The “co-” is as redundant as asking UEA for another review of the CRU. Co-conspirator is in the dictionary at dictionary.com. a fellow conspirator; associate or collaborator in a conspiracy. Notice it says “also conspirator”, which means conspirator does the job, co-conspirator is redundant. The “co-” portion aids in tying the identities of several conspirators into a given conspiracy. Willis, grammar check time. Please stop contributing to the misuse of “co-conspirators”. Sorry for the confusion, my habit of including odd literary and historical allusions sometimes encompasses the obscure. The United States Attorneys’ Manual generally recommends against naming unindicted co-conspirators, although their use is not generally prohibited by law or policy. Some commentators have raised due process concerns over the use of unindicted co-conspirators. Although there have been few cases on the subject, the Fifth Circuit Court of Appeals addressed these concerns in United States v. Briggs. I think the correct term, in this context, is “unindicted coauthor”. [This is followed by definitions of fabrication, falsification and plagiarism.] Narrowly framed this way — and the OIG should be interpreting its regulations precisely — it’s not even a close call. The requested deletions related to IPCC work, not NSF work, and further don’t fit under any of the 3 categories. I’m not saying that this excuses the Penn State inquiry/investigation, but I don’t have a beef with the NSF conclusion, as superficial as it may have been. This endorsement is an endorsement of Penn State’s finding on its definition. I believe Holland’s FIOA was part of a line of inquiry as to whether the IPCC AR4 contained final content that went around the vetting process. The IPCC AR4 content was presented as vetted. So one can state this is a conspiracy to destroy evidence pertaining to whether the IPCC AR4 vetting process was subverted. Whether Mann forwarded an email to Wahl or called him on the phone is not important as to whether Mann engaged in misconduct. He agreed to Jones request to “get him to..” [delete the AR4 emails]. One could argue that is grounds of conspiracy in a legal parallel. So the argument is they deceptively lend the name of the NFS in exoneration on the grounds of jurisdiction, without stating that as the basis. I can’t conclude this is not a problem that discredits the NFS. All of the investigations conducted by academic groups have concluded that the conduct was perfectly consistent with the accepted standards of conduct in the climate science community. The question that has not been examined by any of the investigation is whether the conduct was illegal. Its time for an inquiry that examines the legality of the conduct. I really couldn’t care less whether a bunch of academics think this stuff is all okey dokey. The academics did not describe the conduct as it was. Instead, they misdescribed the conduct and then made findings unsupported by the evidence – a different problem than your complaint. I disagree with advocating “legal” remedies as opposed to demanding that academic institutions police themselves properly. Legality of Jones’ enterprise was considered in the UK, but there is a short statute of limitations. Muir Russell did not consider the matter from the point of view of the U of East Anglia misconduct policy which does not have a six month statute of limitations. It is entirely possible that Jones’ email destruction enterprise constituted academic misconduct, even if the statute of limitations prevented criminal prosecution. This was not addressed in the UK. Similarly in the US, the issue seems to be academic misconduct, rather than criminality. The issue there is not that they failed to open an academic misconduct inquiry, but that they made findings that were unsupported by the evidence. And that the NSF failed to identify obvious defects. I discourage readers from trying to ratchet things up into something that they aren’t. The important remedy is in the court of public opinion. No matter how much legalistic parsing and paring we get from the institutions to allow certain researchers to avoid sanctions, the ultimate impact is that trust is forfeited. Fewer and fewer people believe the researchers or the institutions. Sturm und drang is presently raging in the political sphere because politicians have the temerity to question the pronouncements of the scientific anointed. But those in high dudgeon have to come to grips with reality — this is what happens when scientists and institutions debase the coin of the realm. Steve’s right to focus on the institutions. There will always be bad apples. It has to be the institutions which police the integrity of the process. And if they don’t, the public will end up doing it for them. If if the public has to do it, it will be ugly and sloppy. Many babies will get flushed with the bath water. But that’s the inevitable result when the people charged with upholding integrity fail to do their jobs. Science will suffer and the clowns will point the finger at the public for reacting. But the blame will belong to those who allowed the process to degrade into a circus. Spot on. I still say it’s a good time to be alive. Well, Jones et al. were not afraid of deleting documents – or asking to delete documents – because they’re in charge of the system and they’re in possession of the “higher ends” that justify any means. So they’re not afraid of anything like that; what they possess(ed) are superior powers. That’s something we know damn well from communism. If someone had the task to protect communism whose existence was pretty much put above other laws, he didn’t have to care about some minor offenses such as destruction of evidence against him. The societies today are not controlled by climate alarmism in the same totalitarian way as the Soviet bloc was controlled by communism; but the universities surely are. The universities are arguably plagued by much more authoritative a version of climate alarmism than what the universities have ever seen during communism. So of course that the main “goalkeepers” of the “transcending ideas” have even less reasons to be fear of punishment when it comes to minor offenses such as destruction of evidence, liquidation of fine yet inconvenient papers and journals, or firing of innocent yet inconvenient people. As long as people get away with outrageous propositions of the kind that “climate change is a top important problem the mankind is obliged to wrestle with”, the common understanding of justice will have a lower priority than the ideology which is why illegal and unethical behavior will continue. If illegal activities take place, I agree with Jim Benson in must end up in court. Is it possible that reasonable people can also ‘assume’ they were not negligent in this exercise (even if ‘unhelpful’ to those who want to analyse the analysis)? In Australia, from time to time, there is a judgement by our High Court that invites one to read the transcript. An event happened last week. The precision of the wording is impressive, as are the logic processes. The transcript is not an ordinary set of words; it is quickly recognisable as set apart. For reasons of professionalism displayed by legal people in high office, I am one who would prefer to see an overarching inquiry headed by a respected Judge. In past times I helped formulate a case before the High Court, against our Government. We lost. Perhaps 10^8 dollars was at stake. However, my respect for the High Court did not lessen. We lost because Parliament amended a critical Act at the last moment. My main reservations about a judicial inquiry are conditioned by that interference. If the misconduct procedure of the University of East Anglia is not subject to time limitations, is there anything to prevent a reader here from making a complaint that would involve the investigation of deleting e-mails in response to a FOIA inquiry? It is possible, perhaps likely, that the university might claim that the matter had already been investigated. Would any record of such an investigation be open to a FOIA request? From my limited knowledge of such things there is usually a “catch all” act of misconduct, “bringing the University into disrepute” in many university procedures. This has the advantage of not being bound by time. Until the act complained about is investigated and, if necessary, acted upon, the university one might argue, will continue to be brought into disrepute. It is possible that particular acts of scientific misconduct such as “hiding the decline” could yet be pursued. Yes, the Muir Russell found the “hiding” to be “misleading”. 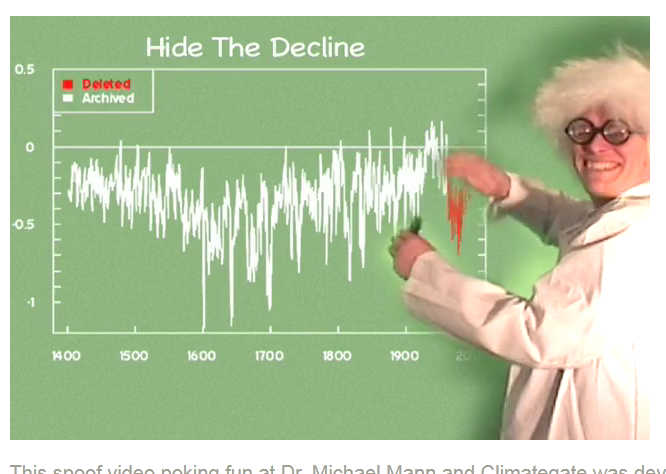 However, as Steve has pointed out, none of the spaghetti graphs used by IPCC states that there has been “hiding the decline” in the particular graph. If “hiding the decline” has already been found to be “misleading” in one situation it can hardly fail to be “misleading” in the use of the spaghetti graphs. The real misconduct and bringing of the university into disrepute lies in the failure of UEA (and IPCC) scientists following the Russell finding to correct the “misleading” impression given by the spaghetti graphs. I wonder if it might also be possible to pursue the use of bristlecones or rather the failure to re-run reconstructions without the use of bristlecones using university procedures. They might well claim that the Muir Russell inquiry was an inquiry within these terms, but it wasn’t. Bristlecones are more problematic with the Mann-style reconstructions; CRU reconstructions are more influenced by Yamal. This has been discussed in previous posts. Have I got this right? Mann was able to produce the e-mails in a handy zip file, therefore they were found not to have been deleted. It may appear to some that the same approach could have provided a similar “loophole”, if needed, for Jones, had he not been so careless with his zip. Your point is an excellent one and I agree with it. What Steve does so well is to put these issues before the court of public opinion. But readers should take note of the link that Steve provides to US v Quattrone. Frank Quattrone was held to a very high standard of conduct by the US Attorney. And the difference between the standards of conduct required of business people vs the standards of conduct required of climate scientists is starling. Briefly, Quattrone was one of the most successful investment bankers on Wall Street. He handled many of the most successful IPOs on Wall Street during the dotcom craze. In December of 2000, Quattrone sent an email to employees reminding them of their obligation to clean up files after an IPO, subject to Credit Swiss First Boston’s (CSFB) document retention policy. At the time, Quattrone was aware of pending litigation regarding one specific IPO (VA Linux) and that the US Attorney was likely to hand down an indictment centering on how CSFB allocated pre-IPO shares to their best clients in the VA Linux IPO. As a result of Quattrone’s email (and nothing else), the US Attorney indicted him for obstruction of justice and witness tampering (serious, big-time felonies). What concerns me is that bias seems to be creeping into our criminal justice system. Individuals who work in less favored occupations like investment banking and held to high standards, while those who work in more favored occupations (like climate science) seem to be completely unaccountable — or at a minimum, are held to the Roman Polanski standard (well of course he did it, but have you seen Chinatown? — or “well of course he did it, but have you seen all the grant money he’s pulled into the University?). All of the investigations conducted by academic groups have concluded that the conduct was perfectly consistent with the accepted standards of conduct in the climate science community. The question is: should the public demand a higher standard of conduct from people who are having such a direct influence on public policy. The more that people become aware of the details of the conduct, they more they will become alarmed by the conduct. Hopefully, this will put enough pressure on the academic institutions for them to do a bit of self examination. One traditional schism in perceptions has been between academia (with tenure and free speech protections) and commerce. Academia was viewed as a profession that involved debate, because the pursuit of science is a battle of ideas. Accordingly, it has been expected that debate and a commitment to the pursuit of valid insights will serve society well, in the fullness of time. Those with poorer ideas will in time be bested, owing to free speech and debate. In contrast, all sorts of laws apply to the conduct of business, partly because business is more important than faculty club debates. This would be why Quattrone’s email was taken seriously, whereas the emails of a bunch of climate scientists have not been. The egg-heads can be viewed as unimportant teachers inhabiting backwater universities talking about topics so obscure, few can understand their work. Where things get problematic in terms of the old model of tolerance for academic mistakes is when unsound science is unquestioningly endorsed by some politicians as the only possible interpretation and then when this is curiously ratified by top drawer institutions like the National Academy of Sciences. Your point is a good one. I think a line needs to be drawn around publicly funded research that is being used to shape public policy. Arguably, the harm that can come from public policy decision that are based on errors, omissions or deceptions by climate researchers is equal to the harm that can come from unregulated stock market promoters. There need to be rules of conduct that are taken seriously and disclosure requirements that ensure transparency. If scientist don’t like these rules, then they can simply refrain from taking public money. I’m not advocating overly broad regulation like Sarbanes-Oxley — rather I like to see basic rules governing disclosure of data and methods that will ensure that errors, omissions or deception can be easily identified by other scientists. Well given the observed outcomes so far among these professional institutions of higher learning, I think it’s fair to say that there wasn’t much of any “professional risk” being taken. McIntyre if you really are a climate auditor then should he not be auditing papers such as the Spencer – Braswell paper?? The Cern Cloud report??? There are so many from both sides. I suppose you will be reposting all the hide the decline emails soon. It must be over a week since you mentioned these!!!!! Steve: The CERN study is well outside my area of expertise. I have never suggested that I can possibly cover every article in the vast climate literature. Spencer and Braswell is outside my core area of expertise, but is being thoroughly analysed by others and I urge you to examine their criticisms. I’m sorry that you feel that hide the decline is being undeservedly neglected, but it has been discussed on previous threads and I urge you to consult them. There has also been some popular satire on the topic which may interest you. When Spencer’s and Svensmark’s theories are taken seriously, then perhaps they will be audited. Instead, Steve has been focusing on those papers which seem to be shaping public policy. At least that’s my perception. The fourth question “How robust are the models used by the Met Office for weather forecasting, climate predictions, atmospheric dispersion and other activities?” is one which begs replies from those who, like myself, doubt the robustness of those models. Unfortunately I lack the knowledge and expertise which you, Steve, and others such as Jeff Id and Willis possess. I hope that all of you will submit replies to that question. It should be a wonderful opportuntiy to disprove that “the science is settled”. Let’s not forget Russell’s attempt to suppress Holland’s submission to the review. My understanding that this was not because anything in Holland’s submission was defamatory, but because it spelt out Jones’s actions so clearly. Yeah, legal advice rather depends on the questions asked. “How can we protect Poor Phil from the consequences of his actions?” is going to receive rather one set of strictures. “How can we get to the bottom of this, without fear or favour, in order to clear out wrongdoing and start the process of rebuilding public trust?” another. Members of the general public are starting to take a deeper interest – but haven’t a clue what buzz-words like NSF stand for. Not once in your post – as far as I can see – do you go any way to enlightening us on this. you would only be helping your cause if you did. pfm, there is a website called climate audit 101 that was set up to help with this common problem. It has a list of acronyms that includes NSF. In fact, you could have got the answer by clicking on the link to the report that is given in the post. PaulM, slightly cheeky off topic question. You said you could see the Santer PDF at Montford’s place. Would it be possible to arrange for you to send me a copy? Is the globwarmqs e-mail address yours? I can send you an e-mail to that address to reply to if that is possible. I decided to reply here because I can reply direct to your comment. Thanks in advance! I have to wonder about this concentration on the institutions from the man who appeared to be telling us that he would listen to the IPCC if he were in government. Why should we not listen to these institutions also as they have helped in their own way to create the current IPCC and government policies? Color me confused as to what appears an inconsistent position.